Son of the Parisian painter Laurent Vouet, little is known of Simon’s childhood or training. According to the 17th-century architect and historian André Félibien, at the age of fourteen Vouet travelled to England to paint a French noblewoman, while in 1611 he accompanied the French ambassador to Constantinople in the capacity of portraitist. From there he left for Italy in 1613, arriving in Venice where he remained until the following year when he moved to Rome, remaining there until his return to France. Vouet worked for many of the great patrons and in particular enjoyed the support of the Barberini family. His early works of this period reveal the influence of Caravaggio and his followers, but he was soon interested in other trends including north Italian Mannerism, Titian and Veronese’s lyricism and the works of the Carracci, Guercino and Guido Reni. 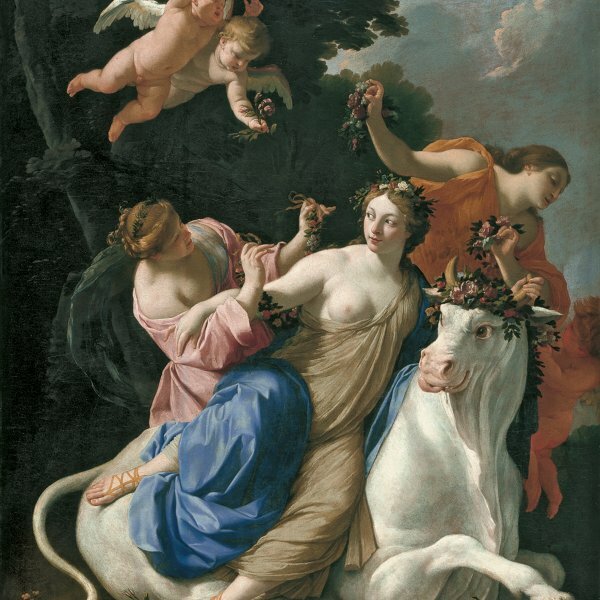 Vouet’s palette consequently became lighter and his compositions more harmonious. In Rome he became a highly regarded painter and in 1624 was elected president of the Accademia di San Luca. During his years in Italy, Vouet had received a pension from the French crown and in 1627 was summoned back by Louis XIII who appointed him court painter and commissioned an ambitious project to decorate various royal residences, including Château-Neuf in Saint Germain-en-Laye, Fontainebleau and the Royal Palace in Paris. Vouet’s return marked the arrival of the Baroque style in France and he introduced an entirely new artistic idiom that had a major impact on his contemporaries and on artists of the following generation. Vouet soon became the leading painter in Paris and began to undertake major commissions to decorate aristocratic residences and churches. His highly active workshop trained almost all the major artists of the mid-century including François Perrier, Nicolas Mignard, Eustache Le Sueur and Charles Le Brun.